Experience the beauty of the Adriatic Sea by cruising on a ferry where you can enjoy warm sea breezes and also visit the beautiful islands of the Balkan Riviera that is situated off of the Croatian coast. These islands are just as exciting and pretty though not as expensive as the French Riviera. The Croatian Adriatic Coast, with its 1185 islands, islets and reefs is considered to be one of the most impressive coastlines in Europe. Finding a satisfactory way to explore this ravishing two thousand kilometers coastline in one holiday is impossible. Croatia is blessed with truly most glorious coastline which has miraculously escaped the over-development of some other Mediterranean holiday destinations. As an alternate to driving on the Jadranska Magistrala, the coastal road that follows the contours of the Adriatic Sea from Rijeka to Dubrovnik enjoy a sea cruise instead. 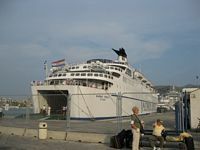 The Jadrolinija cruise line connects the major cities along the Croatian coast as well as numerous islands with the mainland. The line carries passengers and automobiles and traverses the Adriatic Sea and it is a unique and a much more relaxed mode of transportation. It is a very distinctive experience viewing the Adriatic Sea and the Croatian Coast from a very different perspective aboard ship. It makes driving the long hours on the Adriatic highway a distant memory. The ships, “Marko Polo”, “Dubrovnik”, or “Liburnija depart from Rijeka or Dubrovnik. 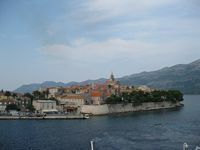 The itinerary from Dubrovnik to Rijeka includes the town of Split and the islands of Hvar and Korcula. Driving an automobile into the cavernous hold of the ferry Marko Polo was relatively easy. The accommodations aboard ship include various levels of cabins or luxury suites. At night their is music and dancing on board the Marko Polo and Dubrovnik in addition to a variety of other games and entertainment. There is an excellent choice of food prepared on board by their Chef. Early reservations are recommended as the prime accommodations are quickly taken especially as the outside cabins are gone in a relatively short period of time. We learned that we should have made our reservations earlier or used the online reservations system. As it turned out we received an inside cabin without shower facilities. At 10:00 AM with a dull thump and the constant drone of the engine the ferry departed Dubrovnik passing to the right of the Franjo Tudjman Bridge as it sailed through the bay as the city faded from view. With white clouds overhead in the sky and the Croatian fly flying in the breeze the ship picked up speed. Ships horns from the harbor were blowing and church bells were clanging as the ship made its way out of the harbor. Sailboats and catamarans passed as we made our way into the open waters of the Adriatic. From the aft deck where tables, chairs and a snack bar were located passengers relaxed and enjoyed the scenery and the warm autumn breezes. Many others on the decks below quietly watched the passage of the sea. Food and drink was available on deck and in the restaurant below. People were conversing in various languages and we met passengers from Ireland and Germany. The price of the Euro was the topic of conversation and its effect on the economies of Ireland and Germany since its adoption. Our first stop on the ferry’s itinerary was the island of Korcula and from the harbor the orange tile roofs and grey stone facades of the buildings shown against the bright sun. The land to the left of the harbor was heavily forested and the mountains on the right looked like slate granite. This is the island where Marco Polo, explorer, writer, and Venetian merchant was purportedly born (1254-1324). There is controversy as to whether he was born on Korcula or in Venice. There appears to be no original document that records his birthplace. However a house in Korcula claims to be his birthplace. From Korcula the ship passes by small islands with usually consisting of only one or two homes and a small church. The ferry port of Stari Grad (Old Town) on Hvar Island is the next destination. Hvar Island consists of two towns, Stari Grad and Hvar town. 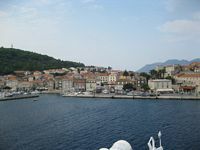 Stari Grad is densely wooded and is located on the northern side of the island at the end of the bay. After a brief stop to embark and disembark passengers and automobiles the ship again headed up the Adriatic. The sun was shining on the buildings in the harbor and on the mountains overlooking the city as we approached Split about 5.00 PM. Later as dusk was settling in and darkness not far away we stood on the deck as the shadows of night approached. As the stars were beginning to shine in the night sky we departed from Split heading for Rijeka. After a quiet meal we retired to our cabin. Cruising all night the ship arrived in Rijeka about 7.00 AM in the next morning. Driving off the ship was remarkably easy although exiting Rijeka required close attention to the road signs as the narrow and hilly streets of Rijeka were a maze. Driving up the mountains leaving the sight of Rijeka behind in our rearview mirror we made our way toward Slovenia as another adventure was about to begin. This short cruise opened up other vistas to explore in the future. The islands of Hvar, Korcula, Pag, and other scenic points along the coast are possibilities to investigate. An extended cruise of the other islands and maybe an overnight stay on Hvar and Korcula would provide enough time to explore and fully take in the beauty of this part of Croatia. In Dubrovnik the Jadrolinija office is located on the waterfront at Stjepana Radića 40, tel. +385 20 41 80 00, +385 20 41 83 80, fax. +385 20 41 81 11. In Rijeka, the JADROLINIJA office is located at Riva 16, 51000 Tel: +385/51/666 111, fax: +385/51/ 213 116. There is a 20% DISCOUNT ON THE RETURN PORTION OF A ROUND TRIP TICKET. www.jadrolinija.hr, passdept_e@jadrolinija.hr. The cost was $150.00 US per person and breakfast was included as part of the package.